Stay at One/Play at Four Benefits – What this means is that although guests will be staying at either the Ocean Spa Hotel or the Laguna Suites Golf and Spa, they will be able to enjoy the amenities at all four of our Cancun resorts: Sunset Royal, Sunset Marina Resort and Yacht Club, Laguna Suites Golf and Spa and the Ocean Spa Hotel. There is a complimentary shuttle that runs all day, every day, between all four of the resorts. Ground transportation from the airport to the hotel. 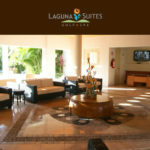 A Reservation fee in the amount of $89 USD and Mexican daily government taxes will be collected at time of reservation. 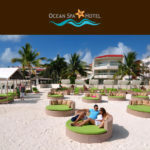 This vacation gift card sponsored by CancunCards and its affiliated resorts, entitles you to five days and four nights of hotel accommodations in one of the safest and most spectacular destinations in the world, Cancún México. This special offer is redeemable within 12 months from your acquisition date. Your vacation travel dates must be booked within 6 months of the acquisitiondate. This unique offer is for you and your family (valid for two adults between the ages of 30 and 70 and two children under the age of 12). Upon check-in adults must present a valid ID and a major credit card for incidentals. Since this is a family promotion, all married or cohabiting couples must travel with their spouse. This offer is not valid for travel by adults who are full time students without gainful employment or by adults whose profession is in the travel, hotel, cruise line or airline industries. This exclusive offer is valued at $699 USD, but you can join us in paradise for only an $89 USD activation fee plus traditional Mexican government taxes, which must be paid upon reservation. Activate your vacation gift card within 30 days from your acquisition date in order to receive additional benefits. All reservation requests are subject to availability, without any blackout dates. The further in advanced you plan your trip the greater the opportunity of finding your desired travel dates. We highly recommend you to book three to four months in advance. Reservations for special holidays such as New Year, President’s Week, Passover, Easter, Thanksgiving and Christmas require the payment of an additional $199 USD fee. This vacation gift card also includes ground transportation from the airport to your hotel. Your own personal travel consultant will be available to assist with you with all elements of your vacation including -if requested- additional nights, excursions, all-inclusive upgrades or any other elements you are desirous of enjoying (all requests are subject to availability and additional charges may apply). This vacation certificate does not include airline tickets. This vacation certificate is valid for one single family at a time; therefore, it may not apply for travel by groups. A group is considered to be two or more vacation certificate holders traveling together and/or two or more couples, families, groups or friends traveling during the same vacation period even if the reservations are booked separately. This vacation certificate may not be used for back to back travel or in conjunction with any other offer or promotion. This is an exclusive one-time family opportunity; therefore, it may not be used for travel by guests who have previously traveled under the same promotional offer. While you are in Cancun, we will invite you to an optional guided tour to discover the beauty and benefits our resorts have to offer. If you decide to attend, our concierges can offer you additional benefits, such as special promotions, discounts, fine dining, tour tickets, nightclub passes or return airport transportation. We suggest that you attend this VIP BREAKFAST, where you will be introduced to our vacation ownership club and learn about the privileges of being a member. In exchange for your time, you will receive these great additional benefits. See your concierge upon arrival to schedule your breakfast; remember you are under no obligation to buy, just keep an open mind and have fun. This gift is 100% transferable, provided that the beneficiary complies with all the terms and conditions outlined above. We are not responsible for delays or expenses that are caused by acts of God. These terms and conditions are final and cannot be changed or altered by any statement, merchant or representation by any individual. 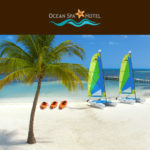 This vacation certificate is being fulfilled by CANCUNCARDS, an affiliated company of CANCUN TRAVEL UNLIMITED, which is registered in the State of Florida as a Seller of Travel. 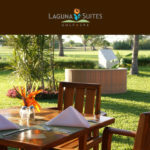 Auction winner will receive one digital vacation certificate with certificate code valued at $699.00. Winner is responsible for destination airfare, taxes, and any fees associated with this package. On the grounds of the magnificent Pok Ta Pok Golf Club, Laguna Suites overlooks Nichupté Lagoon in an exclusive part of Cancún’s hotel zone. Intimate and private, this is the ideal place to relax and unwind. 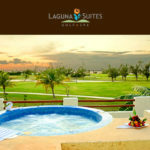 Drink in beautiful views of the golf course and lagoon sunsets while you indulge in a massage or holistic treatment at Laguna Mar Spa. Replenish your body’s reserves with our own Juice Therapy after a round of golf. The beach is always within reach via our free shuttle, providing hourly service to the beach from 8 a.m. to 9 p.m. Ocean Spa Hotel is the perfect antidote to your stress-fueled life. 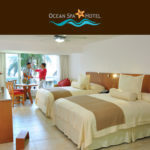 Relax and rejuvenate in a serene beachfront setting with a sweeping view of the Caribbean Sea and Isla Mujeres. Choose from spa packages, yoga, Pilates and juice therapy. 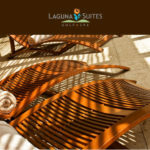 Spa rooms include individualized health consultations, a spa concierge, in-suite hydrotherapy showers and special access to Laguna Mar Spa sauna, rooftop terrace and Jacuzzis. Stay in and dine at one of five on-site restaurants. Or venture out renewed. The hotel is in the heart of the Hotel Zone, minutes from shopping, restaurants, nightclubs and area attractions.